Situated in a residence, just 250m from the beach and 300m from the shops at Pontillac. With: entrance hall, living room of 30m² opening on to the south west facing balcony (sofa bed of 140). Fitted kitchen (fridge, oven, microwave, w.machine, extractor). One bedroom with double bed of 140 plus 2 bunkbeds of 90. Bathroom and WC. SEA VIEW - BALCONY- CENTRAL HEATING - PRIVATE PARKING - SLEEPS 4. 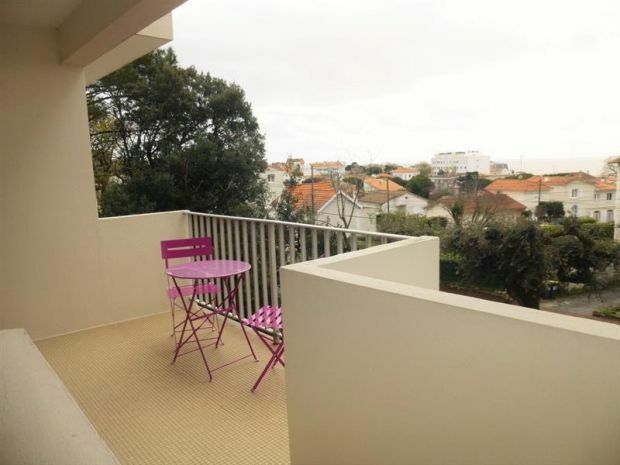 This district of Pontaillac, known as the upscale resort of Royan, opens its streets to offshore winds to bring the invigorating air inside the neighborhood. Corner animated by summer shops and nearby, as well as the famous casino offering an incredible panorama of the ocean and rebuilt in concrete in the 1930s (only local casino escaping the 1945 bombings). Je reviendrai sur Royan mais pas dans ce logement.